Way before I had children I always said I would never host a roller skating birthday party. I just hate how all the kids are herded into a party room for a rush rush hurry hurry blow your candles out type of celebration, all while everyone is falling down due to their skates. Well I have to retract everything I have always said about skating parties in the past. Because when your child wants a birthday skating party, you grit your teeth bare it and host a Monster High Roller Skating Birthday Party. The venue provided the invitations. I had to use them they were our guests tickets to bypass the long entrance line. I was not thrilled with post card invites. I had to do something to spruce them up. 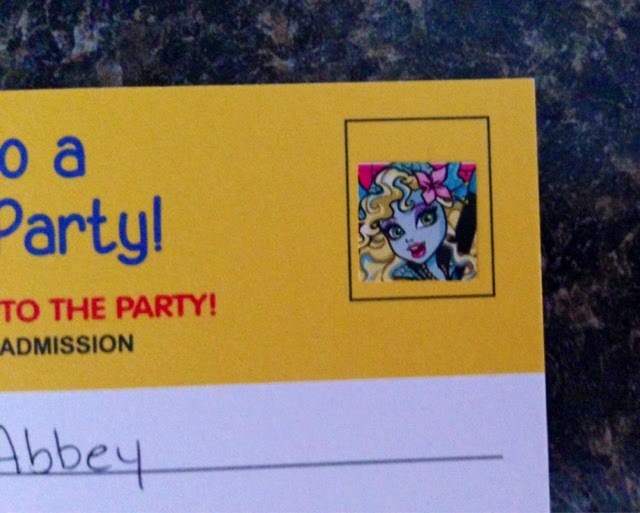 So I got the idea to place Monster High stickers inside the balloons on the invitations. Voila Monster High Theme Roller Skating Invitations. The party room was more of an adventure to decorate. The decorations was the Monster High themed items I brought along blended with skating theme paper cups, plates, napkins and place mates the venue supplied. Some of the tables had table clothes the other ones were bare. On each of the tables I had Monster High Skating themed pictures. The center piece pictures I found online.I just typed in to Google search Monster High Roller Maze. These pictures came from the game Monster High Skultimate Roller Maze. I think the walls really added character to the party theme. I got the Monster High balloons at Party City. My daughter loved the balloons. You can't have a birthday party without a Happy Birthday Sign. Here is another view of what one of the tables and the gift table looked like. If you are having a Monster High theme party you must have a Monster High Coffin cake. I wished I could take credit for this cake, but I have to give the baking credit to Heitzman Bakery in Louisville, KY. With a infant in the house there was no way I had time to bake a cake. I was just thankful for a Groupon. The cake tasted awesome. It turned out amazing. Overall my daughter had a wonderful birthday party. I wished I was able to decorate more but it was what it was. If one of my children asked to have a skating party again I would diffently do it again. Everybody had so much fun even the adults. Have you had any adventures throwing a skating party? I would love to hear them. Or have you thrown a Monster High party? I want to see pictures and hear how you decorate.